Does it seem like you spend more time cleaning up cat litter granules outside of the box, then you do with your feline friend? This is a common occurrence among pet parents and a huge complaint for those of us that can’t tolerate the mess. In this post, we will take a look at the reasons why cat litter tracks, what a cat litter mat is, the types of these mats and our top 5 picks on the best cat litter mat on the market today. We will review these products and their rating scores (out of 5) in more detail at the end of this article. Why Does Cat Litter Track? What is a Cat Litter Mat? As the name implies, a cat litter mat is simply a piece of PVC, rubber (or other material) that is placed in front/under the litter box to capture the granules before they can track throughout your home. Depending on the material the mat is made out of, these can typically be picked up and shook off, vacuumed or even washed. They can also come in a variety of colors, sizes and shapes to fit under/in front of any style of a litter box. There are two basic types of cat litter mats; PVC and the rubber-style. Let’s explore these two options. These types of cat litter mats are generally made of dense PVC-mesh that is designed to capture the litter but are still comfy for your cat’s feet. The mesh part of the mat works to “wedge” the granules, trapping them until it can be vacuumed or shook off. PVC tends to be on the cheaper side of the price point, but they will also have to be maintained more than the typical rubber cat litter mat and can be more prone to staining and water damage. However, they do come in a variety of colors which makes matching them to any decor a snap. These cat litter mats can be made from many rubber-like compounds. They differ from PVC as they are designed with large holes on the top of the mat that allows the granules to fall through to the solid piece on the bottom of the mat. Oftentimes, there will also be a middle layer made from an absorbent material to capture liquid that may cause odors. The great thing about rubber mats is that they can typically go longer between cleanings; however, since they are made from rubber, they can be unsightly in some decors. With so many choices when it comes to picking the best cat litter mat, we’ve done some research and have found some that may be the best choice for you. Check out our top 5 picks. The Pawkin cat litter mat has been laboratory tested to be safe for both your feline friend and your family. The litter lock mesh will trap even the tiniest of granules to keep your house cleaner and your cat’s feet fresher. The extra large size is perfect for those litter “diggers and throwers” and it even comes in three neutral colors to fit any decor. One concern that may come up is the price point on this mat may be considered high. The overall rating of the Pawkin Phthalate Free cat litter mat is 5 out of 5 for its convenience and eye-pleasing design. The dual structure of the Moonshuttle Blackhole cat litter mat is as effective as it is convenient. 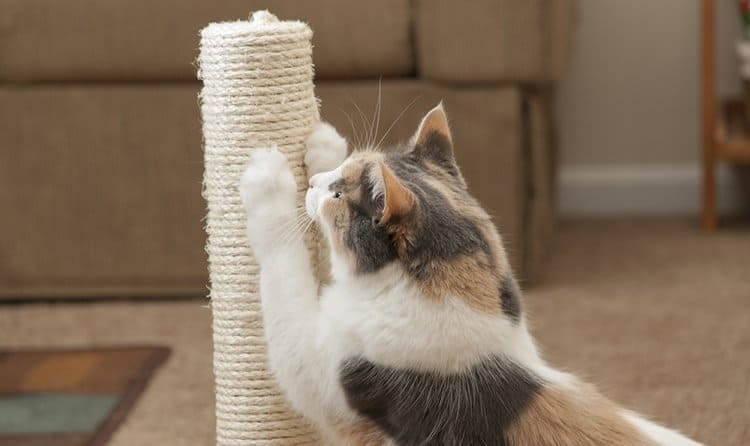 The upper piece of the mat has deep holes and round nubs that are soft on Kitty’s paws, yet quickly removes the litter from them before they can reach the rest of your home. It’s super easy to clean and has a patent pending on its unique push-and-pour out technology. In addition, this cat litter mat is made from non-toxic foam rubber. One concern that may come up is this mat is a tad more expensive than others and it does weigh two pounds which may be cumbersome. Made from FDA-approved silicone, the PetFusion ToughGrip may be the cat litter mat you’ve been searching for. The wave-patterned soft inner ridges effectively trap the granules, while still being soft and acceptable to even the finickiest of feline feet. The unique design and silicone material make cleaning this cat litter mat very simple; use a broom, vacuum or sponge. In addition, this unit is waterproof, anti-microbial, non-toxic, hypoallergenic and holds less odor. One concern that may come up is the the PetFusion ToughGrip cat litter mat only comes in gray and it will need to be butted up against the box for maximum performance. The overall rating of the PetFusion ToughGrip cat litter mat is 4 out of 5 for its convenience and high-quality features; however, it has been dinged due to the lack of color choices. Elegant, yet efficient! That’s what the buzz is about for the Easyology Premium cat litter mat. This design uses extra thick and extra large PVC material that is sure to last longer than thinner mats. The patented grooved system traps up to 37% more cat litter, which means less mess in your home. Plus, it’s super easy to clean, just wipe, shake or vacuum and you’re done. It even comes in 6 pleasing colors to match any decor! One concern that may come up is this unit is water-resistant, not waterproof. The overall rating of the Easyology Premium cat litter mat is 5 out of 5 for its pleasing design, color options, and overall convenience. This cat litter mat makes trapping those granules look easy. The patent-pending design applies an exclusive plastic film that will repel urine so it doesn’t absorb into the mat itself. The extra large holes trap litter better so it can be shaken off or washed away. In addition, it comes in two colors and even a jumbo size for multiple litter boxes. Plus, you can even add a puppy pad in between the two layers for those super messy felines. One concern that may come up is the outer mesh used can absorb urine, so it may not be suitable for some cats. The overall rating of the iPrimo Litter Trapper cat litter mat is 4 out of 5 for its durability and odor fighting properties. However, the nylon mesh may pose a problem for some pet parents. Now that you know you need a cat litter mat, find the one that works best for you and your feline friend. Our top five have made the best-of-the-best list so start there to choose your favorite.